All Posts Tagged With: "Lierac Paris"
Wonder what Marta uses on her skin? 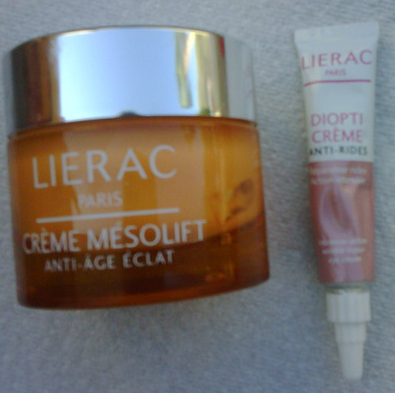 Well, recently I’ve discovered Lierac Paris Crème Mesolift Anti-Aging Radiance Cream and Lierac Paris Diopticrème Age-Defense Cream eye cream. The face cream is super hydrating yet doesn’t feel heavy or greasy. It smells really fresh, a bit citrusy. And the Lierac eye cream penetrates into my skin quickly and it doesn’t leave white creamy residue under my eyes. Know what I’m talking about here? It’s when my eye cream doesn’t absorb into my skin fast it just sits over my skin, so when I sometimes forget to look I have funny white cream under my eyes. And, the good news Lierac Paris skincare products are available in CVS!! Company description: Lierac Paris Crème Mesolift Anti-Aging Radiance Cream was inspired By Facial Mesotherapy, a technique developed in 1952 by French Doctor Michel Pistor involves injecting nutrients directly into the skin activating collagen production and lymphatic drainage. Backed by validated scientific research that confirms the impact of nutritional elements on skin metabolism, mesotherapy can deliver an undeniable benefit in facial rejuvenation through a technique called Mesolift. The laboratories at Lierac Paris have taken this technique and adapted it to a highly penetrating topical daily moisturizer called Crème Mésolift that’s non-invasive and with effective results.